‘Spa’ – what comes to your mind when you come across that word? Most of us associate it with relaxation, getting a body massage, a foot massage or a head massage, right? Interestingly, the expanse of spa therapy goes way beyond all the above mentioned treatments. It’s a potpourri of massage treatments done with the help of essential oils, aromatherapy, steam therapy, mineral water baths and lot more. Nobody knows the exact derivation of the word and this leaves us enumerating a few possible theories behind it. Not only does this piece aim at simplifying the varied concepts involved in spa therapy but also guide you on how to do hair spa at home. Essentially, the word spa stands for a healing bath in a spring or a pool of mineral water. Since pre-historic times, people would travel to distant locales to take a ‘healing, rejuvenating’ bath in hot or cold springs. Many believed that such baths could help in balancing the body’s various chemicals and fluids. From Native Americans, Persians, Egyptians to the Greeks and the Romans, these were some of the firsts in the world to indulge in such therapeutic baths. These ancient baths can be found in Greece, Bulgaria, Netherlands, Germany, England and many other European countries, many that were a part of the erstwhile Roman Empire. Another theory suggests the word 'spa' to be an abbreviation of the Latin phrase 'Salus Per Aquae' which translates to 'health through water' in English. Belgium has a small town called 'Spa' which was once known for its medicinal baths. Even in England, you would find towns popular for their springs and medicinal baths, one of them is actually known as the town of 'Bath'. Hippocrates is believed to be one of the first propagators of medicinal baths and to have put much emphasis on the role of perspiration, body massages and baths to cleanse and rejuvenate body - and to get body's chemical composition in balance. The modern spa treatments have gone way beyond just the medicinal, therapeutic baths. Taking a cue from what Hippocrates had suggested years ago, spa treatments today focus extensively on massages, inducing perspiration and focusing on the overall cleansing and rejuvenation of the body. Now, various herbal and essential oils have come into play along with treatments like sauna, aromatherapy, thermal therapy and much more. When it comes to pampering yourself, there’s nothing like getting a good treatment that focuses on the head. The stress, the pressure, the countless pacing thoughts and calculations build up in our minds and to unwind and get a good head massage is something that needs to be a frequent item on the to-do-list of all modern day professionals. We all used to love the weekly oil champi given to us by our mums or grannies, which was an excellent way to nourish the hair and feel rejuvenated. 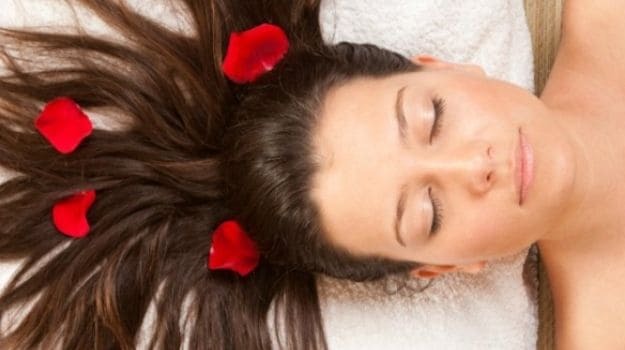 Now, you can simply head to a hair spa, which is a professional treatment combining the concept of head massage with various hair nourishing therapies. If your hair breaks easily, lacks strength, bounce, shine and lustre then hair spa can help you get back the glory of your crown. Professional spa treatments target at nourishing the roots as well the body of your hair along with maintaining the health of your scalp, treating dandruff, keeping a check on oil secretion, combating split ends and deep conditioning the roots for that enviable shine and lustre. However, dermatologists also caution against the chemical-based spa treatments as most of them will give you just temporary results and are capable of doing long term damage to the overall health of your hair. "As a dermatologist I am strictly against chemical-based hair spa therapies. It is always better to use natural ingredients for your hair and skin. 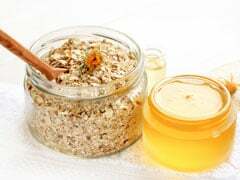 You can always do a hair spa on your own over a weekend or ask someone to do it for you with ingredients that are readily available in your kitchen pantry. 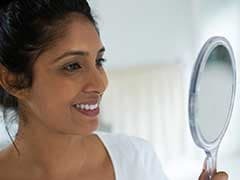 However, if you don't have the time or patience for it, look out for salons that offer natural hair spa treatments which are absolutely chemical free," shared a leading Beauty Expert and Dermatologist, Dr. Deepali Bhardwaj. 3. Message your hair and scalp with a hair/scalp nourishing mix - beer/vodka +white vinegar + curd for oily scalp, curd + banana for dry scalp, and curd + papaya for combination scalp. 4. Put a hair cap and leave for 10 minutes. 6. Take a hot towel and wrap around your head - this will facilitate opening of the pores and absorption of various nutrients. 7. Apply hair pack (reetha/amla/sheekakai/mehendi) and leave for 10 minutes. 8. Wash and apply serum. - Never leave oil hair in your hair or go for a drying-spa treatment if you have dandruff. 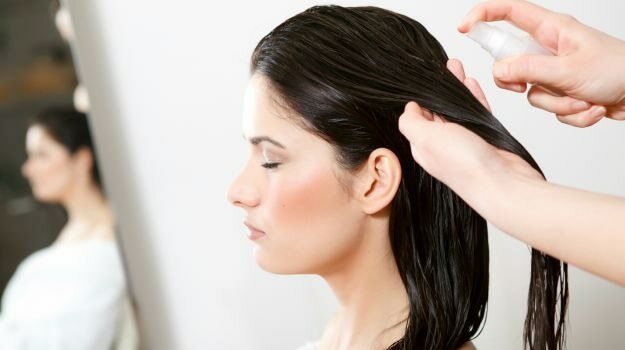 - Make a mix of lemon juice + white vinegar to put on the scalp to get rid of dandruff. Wash after 10 minutes and follow this method for three consecutive days. - Avoid blow drying or chemical treatments (rebonding, perming, curling, pressing, et cetera) as much as possible. - Chemically treated hair should not be given spa treatment at all. It may lead to hair fall and alopecia. - Go for natural hair spas or DIY spa at home at least once a month. - Lemon doesn't bleach you hair it only makes it stronger, fights dandruff and excess oil; and maintains the pH level of your scalp. - Rinsing hair with beer will give it a sparkling shine and a sensational bounce. - You can include any ingredient in your hair care regime - from avocados, milk, curd, reetha, shikakai, olive oil, castor oil, lemon, eggs, beer, white vinegar, fruits, et cetera - depending on your hair type and scalp condition. - Also, never leave your hair wet for long and avoid application of hot oil. Never comb when you hair is wet (or use a wide-toothed comb) and never put conditioner on the roots. According to a renowned beauty expert Blossom Kochhar, hair spa helps "you to relax and aids in rectifying hair and scalp related troubles like hair fall, dandruff, oily hair and scalp. Hair spa helps not only the scalp but the entire length of the hair. It is different than regular oiling, massaging and conditioning. It commences from a detailed hair analysis, application of specialized products like serums for the hair, follicle and hair types. One can go for a hair spa once in every two weeks." Ms. Kochhar also shared with us a couple of hair masks that you can easily make at home and include in your hair-care regime.